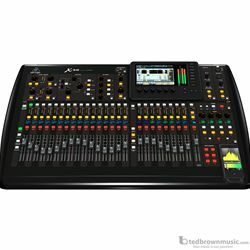 The BEHRINGER X32 has changed the game by completely rethinking what is possible from a digital mixer - and tens of thousands of new users are enjoying the results. A fluid workflow coupled with a fully interactive user interface ensures immediate familiarity and instills confidence. Advanced engineering and meticulous design deliver stellar sonic performance at an extremely affordable price - changing the game entirely. Three companies shared a common vision - to engineer and build the very best-sounding, technically-advanced audio products for discerning professionals. The X32 Digital Mixer family is the result of the engineering, manufacturing and application expertise of legendary console manufacturer MIDAS, the iconic signal processing genius of KLARK TEKNIK and BEHRINGER's unique ability to deliver a superior value proposition. With the introduction of the new 2.0 firmware, we have not only dramatically improved the workflow, but also added all-new capabilities including "Acoustic Integration" for total connectivity and control of your speaker and In-Ear Monitor (IEM) systems. Then we completely re-imagined the more than 50 onboard FX "Plug-Ins" and added classic processor examples based on "True Physical Modelling". We've also made the X32 even more flexible, with swappable expansion cards for connecting to other multi-channel audio networking via USB, ADAT, MADI and Dante protocols, in addition to the onboard ULTRANET and AES50 connectivity. 7" Main Display: X32's 7" day-viewable color TFT (Thin-Film Transistor) display shows the setting parameters you need when you need them. DCA Groups: DCA (Digitally Controlled Amplifier) groups allow control over several signals at once without actually mixing them into a subgroup bus. X32's 8 DCA groups let you control multiple signals via a single fader, such as the entire drum mix, the horn section, or the backup vocalists, etc. DCA control affects the FOH mix, while allowing the individual buses to remain unchanged. The result is a customizable workflow that provides maximum flexibility, but still allows individual buses and subgroups to serve the purpose they were intended for, such as zone sends, broadcast feeds, etc. "Acoustic Integration" the Live Sound Revolution: X32-2.0Legendary 40-year old British company TURBOSOUND, famous for producing some of the world's best speaker systems, have teamed up with BEHRINGER to seamlessly integrate mixer and speaker systems. The X32's ULTRANET bus allows streaming up to 16-channels of pristine digital audio to an array of TURBOSOUND iQ speakers - all on a single CAT5 cable, along with control data to set sound presets remotely.Furthermore, the iQ Series features "True Physical Modeling" of some of the most popular speakers which can be easily remote controlled via the X32, allowing the sound engineer to apply different speaker models in real time from the comfort of the mixing desk.